Categorizing mechanics can be a tricky thing as we recently saw in a series of articles about whether or not Settlers of Catan is a worker placement game (Here’s the Point and Counterpoint to get you caught up). Rigid definitions aside, it’s helpful to know what type of games are out there and once you’ve identified what you like there’s a multitude of other games that share similar mechanics. We’ll be picking out some of the most popular mechanics (or at least our favorites) and exploring how they work, what games use them successfully, and why we love them. This week let’s take a look at Tableau Building. There’s a satisfaction that comes with building something from the ground up and watching it slowly come together. Whether it’s a vast empire that spans across your land or a complex machine that has many parts that have to work together in perfect unison. Tableau Building lets players physically put their pieces into place, building a working engine to accomplish the task ahead. Tableau Building: How does it work? Players each have their own area, known as their tableau, in which they can place cards (or tiles or whatever the game uses). These cards provide some sort of mechanical benefit to the owning player as long as they remain in play. This can take many forms such as providing additional actions or boosting an existing action. The benefits will often stack and synergize with each other providing incentive to play cards that work well together. The interesting thing about Tableau Building is that it often uses another mechanic to drive the action so that your tableau can support that action. Let’s explore the benefits that building up a tableau can provide to a player by looking at some examples from games that use the mechanic. We’ll start by looking at San Juan, a role selection game that incorporates Tableau Building. Players perform actions during the game by selecting various roles, each role has a unique action associated with it. 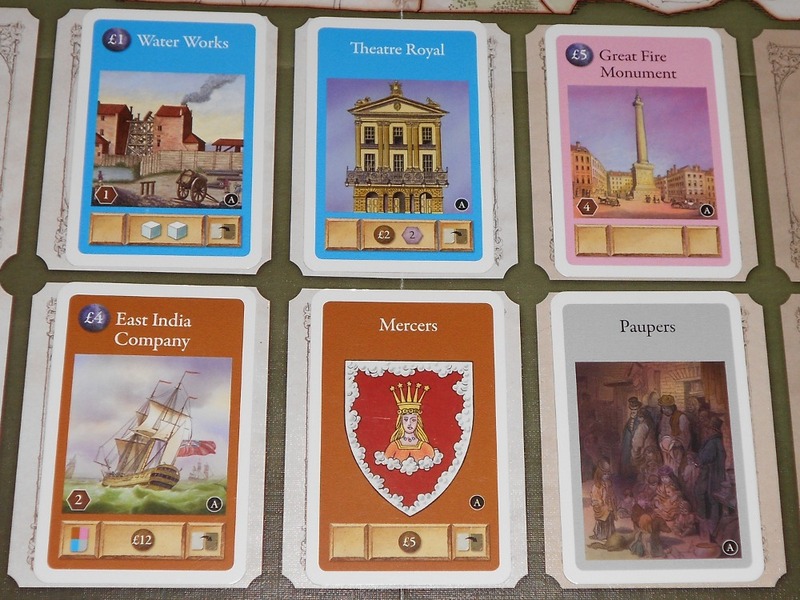 The cards that are placed on a player’s tableau are buildings which boost a specific role. For example, the Builder role lets players put a building from their hand onto their tableau by paying its cost. The Quarry is a card that boosts the Builder role by providing a discount when building. Multiple different buildings can be played that boost the same role such that a player will get multiple benefits when that role is selected. As players build up their tableau their actions become more and more powerful as they are boosted by all the cards that they have in play. Next let’s look at Innovation, this one is more of a pure Tableau Builder. Players each represent a civilization that is developing technologies represented by cards that they play in their tableau. At the start of the game players can take a number of basic actions: draw a card from the lowest age deck, play a card to their tableau, and activate a card. Each card provides the player with a unique action that they can take by activating the card. Sometimes these are just more powerful versions of the basic actions such as drawing or playing more cards at once. Other cards provide entirely new actions such as manipulating the cards on the tableau, scoring cards, or stealing from other players. As the game progresses, players will have an ever changing set of actions that they can take based on the cards that they have in play. A number of other games use popular new mechanics along with Tableau Building. Homesteaders uses an auction mechanic to acquire tiles for your tableau and worker placement to activate them. 7 Wonders uses card drafting as a mechanic to select cards that you play to your tableau. Eminent Domain uses deck building and role selection to allow players to develop their tableau. The Manhattan Project uses worker placement as a means to acquire and activate cards on your tableau. There are many more examples of how Tableau Building is often paired with other mechanics but, as with Innovation, it can stand on it’s own as well. One of the things that makes Tableau Building work so well is that it gradually introduces complexity into the game by allowing the players to start from a very basic state (an empty tableau) and build up one card at a time. This is a form of information control, if you need to take in a lot all at once it can be very overwhelming but introducing new information as players bring cards into play presents a much more manageable way to take it in at a more steady pace. The gradual build up of pieces is often comparable to building an engine. Each new piece that is brought in to play interacts with the previous pieces in a way that makes things easier and more efficient for the player. Developing a tableau creates the impression of becoming more powerful as the game progresses and this often links together with a theme seamlessly. If you’re a civilization advancing through the ages then the cards that you play can represent technologies that mark your progress. If you’re an architect designing a city then the cards can represent your workers, tools, and ultimately the buildings in the city itself. For some, part of the trouble with these type of games lies in the lower player interaction that is a natural result of each player building up their own area. Not to say that you can’t go over and mess up what another player is doing but the goal is ultimately to build something so that is naturally the emphasis. This can create a multi-player solitaire experience in which players are each hard at work on their own tableau only briefly glancing at the other players’ cards to gauge how well they are doing. How much this is the case will often depend on the other mechanics involved. Here’s a brief timeline of popular Tableau Builders that have come out across the years. This is in no way intended to be a comprehensive list, merely a representation of some games that present a unique take on Tableau building. What do you think about the Tableau Building mechanic? Do you enjoy building up your own engine or would rather have a shared board where you can interact more with the other players? Are their any Tableau Building games that you love that didn’t make it onto the Timeline? I haven’t actually played any game with this mechanic yet but now I’m very interested. I do like to interact with other players when at the game table but I do also really love the aspect of building towards something. I think that was largely why I was addicted to MMORPGs for so long. I felt like I was adding more and more to my character and opening up new paths. I’ll have to give one of these titles a try! I love that building-toward-a-goal aspect as well. A very interactive tableau-building game is Glory to Rome. It has aspects of role selection (like San Juan), but it’s also got a huge punk factor and is very interactive. Innovation is also very interactive and punky. The interaction here is more like conflict. Tournay might be up your alley if you don’t want direct conflict. Tournay involves building an individual district of a city. The interaction comes in that you can 1) use other players’ workers by paying their wages and 2) score points off of their buildings at the end of the game. I’d probably say that GOSU is probably the most interactive of all the games that I listed and is fairly aggressive as far as Tableau Builders go. It’s best played as a 2 player game and is a good example of building up your tableau while messing with your opponent’s progress. I’d also second FarmerLenny’s recommendations of Glory to Rome and Innovation as fairly high on interaction. Depending on how much interaction you like card drafting can provide a relatively friendly experience but still cause you to keep tabs on what the other players are doing in order to succeed. Saint Petersburg, 7 Wonders, London, Last Will, and Tournay are all fairly good examples of this. I LOVE the tableau building genre. 7 Wonders, Race for the Galaxy, and Puerto Rico are some of my favorite games out there. A friend of mine bought Glory to Rome. We played through the “intro” version of the game and even that was quite intensive… I read through your review of the game and I think I’m more willing to give it a second try now. I was quite intrigued by Innovation. There was a slight learning curve there, but my wife tried it and actually liked it, which is a huge win. Normally she is not one for the tableau genre. Would you clasify Galaxy Trucker as a tableau builder? You have your own tableau and the most interactive part of the game is building it, but it doesn’t have many of the advantages you mention. You need to understand the complexity up front and as a whole the game makes you feel less powerful your ship inevitably falls apart. I would not classify Galaxy Trucker as tableau building. While Vlaada Chvatil’s designs often push the boundaries of genre, Galaxy Trucker is more of a tile-laying game. While you have a “tableau” in a sense, what’s more important is selecting tiles that must connect with existing tiles on your board. While the tiles do add more “abilities” in a sense, the build isn’t really gradual in that you do all of your building at once before you have any sort of response to your abilities or opportunities to use them. I agree that the main thing disqualifying Galaxy Trucker for me is that once a tile is in play it doesn’t have any effect until after you have finished building. If you want some examples of games that more closely toe the line between tile-laying and tableau building I would point to Glen More and Castles of Burgundy. I’ve seen the consensus go both ways on those games. This goes to show how hard it is to pin down exactly what defines any given mechanic. Tableau Building seems to be pretty tricky in that regard and I’ve seen people that would even disagree with some of the games that I included in my list. I could argue that tiles add abilities immediately in that they influence what other tiles can be placed nearby. Making it easier to select and fit other tiles is pretty much the sole function of an internal structure tile, which doesn’t have a designated purpose once the flight starts. On reflection I think it’d be a fairly weak argument though, I can see that there’s a fairly significant difference between that and games where new cards (tiles/pieces/whatever) significantly change how you interact with the game immediately. Particularly the second point that cards “have a lasting effect on game mechanics as long as they are in the tableau” applies to discussing Galaxy Trucker. The thing about tiles opening open spaces for placing more tiles is that it doesn’t present any new way to acquire/place tiles or provide any additional interaction during “building”. At the beginning of the round the mechanics that define tile acquisition and placement are in place and remain unchanged by the placement of tiles throughout the round. You can only ever place tiles from the general supply into an empty space or your board in such a way that it is connected to another tile. If placing a tile would allow you to do otherwise then maybe you would have some grounds for saying that the game contains Tableau Building. Great article! I am excited to check out some of these games and try to incorporate the tableau building mechanic into my game designs.